Art of painting has always been very important in my life, as any other arts. Once you are in music, everything is intertwined and enriches each other, creates more analogies, associations, and deepens music interpretation. I constantly encourage my students to learn arts and visit as many exhibitions as possible. Oglethorpe University Museum of Arts is the museum in Atlanta which has become my favourite instantly. When I came to Atlanta in 2003 and visited the museum the first time, I immediately sensed familiar, intellectually intense atmosphere. Through years, I have never been disappointed in my first impression, whether it was thoughtfully presented various exhibitions from all over the world, accompanied by the series of insightful and extremely intelligent lectures, or series of concerts. No doubt that the host of the museum, director Lloyd Nick, was “the soul” of this unique for Atlanta place. His and his wife interest in meaningful, spiritually intense art, which implies to influence, wake up, develop and release intellectual and emotional energy of the audience – has been the main aim of their very specific and selective preferences. Moreover, his last lecture in conjunction with nationally recognized exhibition at OUMA “Mandalas by the Patients of Carl Jung” has confirmed his interest and striving to be literally well rounded as a human being as well. Sanskrit “Mandala” means “circle”, the most harmonious shape in the world, which the Swiss psychoanalyst’s patients used for the self-expression of the internal universe. One can recall confined in the circle “Yin” and “Yang”, St.Peter’s cupola, brain progress forcing perplexing labyrinths, and other numerous examples of the magical round shape objects, which Lloyd Nick displayed in abundance in his lecture. 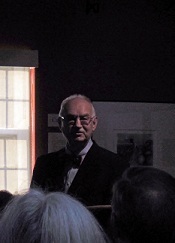 As his wife consents and what I have experienced myself — he had always been a “round” person, sensitive to surrounding people, tolerable, capable of compromise in consideration of the conflicting opinions, and very inspired to learn intellectually and share his discoveries through his unremittingly dedicated work as a director of the museum. 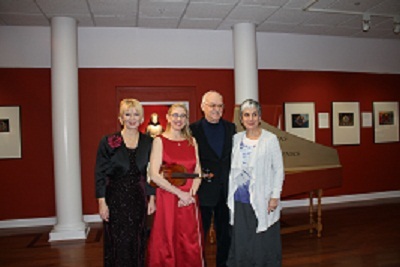 I was lucky to have always open the doors of the museum for my musical programs, either piano or harpsichord ones, through the years. Some of them were motivated by Lloyd and his exhibitions. Lloyd Nick retired to pursue his painting and hopefully volunteer with his new alarming our intelligence lectures about art in the round shape world.